Can yall believe Christmas is just around the corner? I mean literally, we are 2 days away from the most magical day of the year. The little kid in me is so excited! Before I sign off from the interwebs for a few days to be with family and celebrate the birth of our savior, I always like to share our Christmas card for the year. 4 So Joseph also went up from the town of Nazareth in Galilee to Judea, to Bethlehem the town of David, because he belonged to the house and line of David. 5 He went there to register with Mary, who was pledged to be married to him and was expecting a child. 6 While they were there, the time came for the baby to be born,7 and she gave birth to her firstborn, a son. She wrapped him in cloths and placed him in a manger, because there was no guest room available for them. Love your card-so sweet! And I think the picture looks great! Love your card - and especially the look on Jenny's face! I absolutely love your card, wishing you a Merry Christmas. Great christmas card. Blessing for 2015! This is so amazing that Taylor is a part of your family picture! You are such a testament to the unconditional love every parent should offer their children, and you are and will continue to be amazing parents to your little angel and as your family continues to grow! I wish you a truly Merry Christmas! 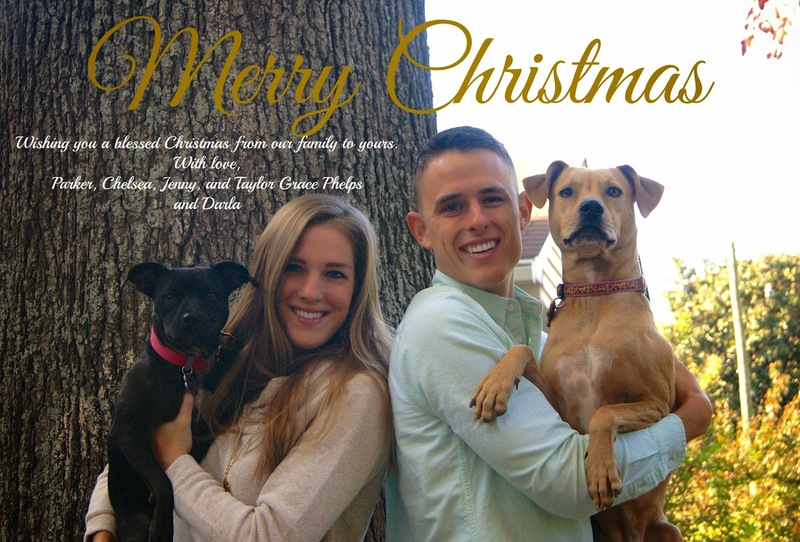 And a huge props on getting both dogs to look at the camera, a seemingly impossible task in our family! I love your Christmas card! When it came in the mail, I showed it to my family and Brandi said "Chelsea is so pretty!" So sweet! and such a beautiful card! Merry Christmas to you guys!